Round and Baguette Diamond Vintage Classic Engagement Ring | Shane Co.
A woman with vintage taste and elegant style will adore this engagement ring setting. The ring displays round diamonds alternating beautifully in a channel setting with baguette diamonds for a unique look. Milgrain detailing accents throughout the design providing a delicate look. A total of eight round diamonds (approx. .58 carat TW) are displayed in this setting in addition to six baguette diamonds (approx. .17 carat TW). This ring is crafted of quality 14 karat white gold, measures 3.5mm wide and has a total gem weight of approximately .75 carat. 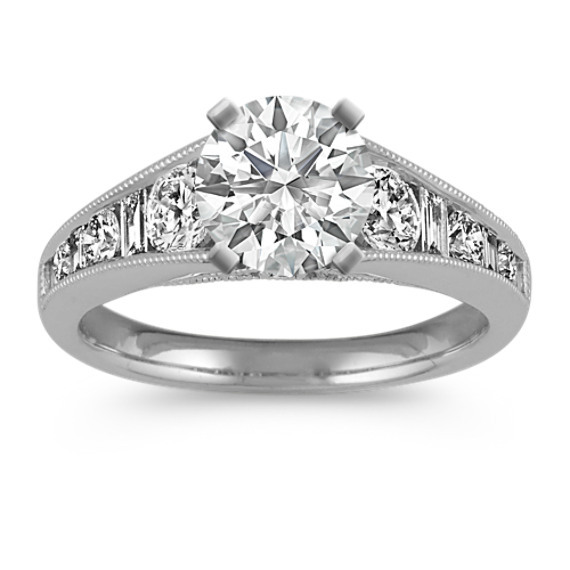 Complete this engagement ring with the center diamond of your choice.